The Elephant Tower (Danish: Elefantporten), also referred to as the Elephant Tower (Danish: Elefanttårnet), is the most famous landmark of the Carlsberg area, the original brewery site of the Carlsberg Breweries, which is now under redevelopment as a new neighbourhood in Copenhagen, Denmark. It takes its name from four large granite elephants which flank the gate, standing back to back, carrying a small tower on their backs. 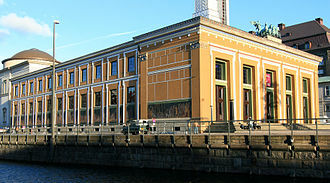 Completed in 1901, the Elephant Gate was built at the same time as the Ny Carlsberg Brewhouse. Together with the original Ny Carlsberg building and the Dipylon, they completed the main Ny Carlsberg complex around a central courtyard. The new Elephant Gate made the entrance to the brewery from the Valby side, complementing the Dipylon which marked the entrance coming from the city. The architect was Vilhelm Dahlerup who also designed the previous stages but not the new brewhouse which was designed by Vilhelm Klein. The space above the gate originally served as a water tower and herb silo. Typically of Ny Carlsberg's architecture, as well as of Vilhelm Dahlerup's work in general, the Elephant Gate is built to a colourful Historicist design which freely relies on inspiration from different periods and cultures. The elephant feature, which was Carl Jacobsen's own idea, was inspired by Bernini's obelisk-carrying elephant on Piazza della Minerva in Rome. The four elephants were created by the sculptor Hans Peder Pedersen-Dan based on a sketch by Dahlerup. The upper tower, which has a floor area of only 115 square metres, is built in red, ornamental brick. 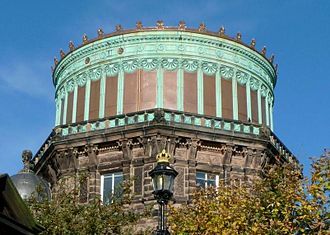 It has tall, round-arched windows and is topped by a copper-clad onion dome. Wikimedia Commons has media related to Elefantporten, Carlsberg. The Ny Carlsberg Brewhouse is a historic, listed building in the Carlsberg district of Copenhagen, Denmark, on the border between Vesterbro and Valby. The Ny Carlsberg Brewhouse was built by Carl Jacobsen as the new brewhouse of his Ny Carlsberg Brewery which he had founded after a conflict with his father, Carlsberg-founder J. C. It was designed by Vilhelm Klein and completed in 1901, replacing a smaller still to be seen on the opposite side of the road. The new brewhouse complex included a storage house to the east. In 1920 the brewhouse complex was extended northward by Carl Harild, when the facilities became outdated, the buildings were put to other use. In 2006, Carlsberg decided to close the Valby brewery and instead redevelop the area, in 2008, the year beer production on the site was discontinued, the brewhouse became a listed building. In early 2011 it was stripped of its inventory and most of its furnishings to prepare it for other use, the Ny Carlsberg Brewhouse is built in the Historicist style which characterizes the rest of the Carlsberg area. Halmtorvet is a public square in the Vesterbro district of Copenhagen, Denmark. It is located next to Copenhagen Central Station in front of the Meat District, the oblong square eventually turns into Sønder Boulevard, a broad street with a park strip in its central reserve, which continues to Enghavevej at Enghave station. 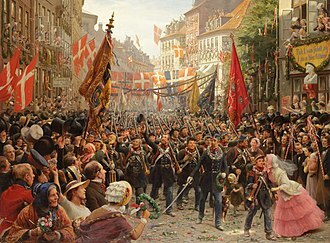 Copenhagens haymarket was located just inside the Western City Gate where the City Hall Square lies today. It closed on 1 January 1888 and relocated to the area outside the new Livestock Market which had opened at the site in 1879. Market days were Wednesday and Saturday and up to several hundred loads of hay and straw were traded and distributed to cattle and horse stables around the city. Up through the 20th century, with improved infrastructure, livestock moved out of the city and horses lost their role in transportation, the area fell into despair and became associated with prostitution and drug dealing. The site was dominated by through traffic and goods transport. The area underwent gradual gentrification up through the 1990s and Halmtorvet was thoroughly refurbished from 1999 to 2003 as part of a programme for urban renewal in the Vesterbro area. The first stage was designed by the office of the City Architect, the second and third stages were designed by the Park Office of the City and carried out in 2003. In order to obtain a coherent space in the area a large gas regulator in front of the Brown Meat District was removed, the square has an oblong shape. To make the more attractive to urban life, the new layout introduced one-way traffic which is taken along a single lane on the south side of the square. A roundabout on the corner of the Brown Meat District, distributes traffic south and north of the Central Station, in the centre of the square, in front of Øksnehallen, there is an oval pool surrounded by large open spaces and playgrounds. Other areas have elevated lawns and flower beds with terraced sides, other elements in the refurbishment include new paving and items of street furniture. The north side of the square is lined with buildings from the 1890s. Built in 1961, Borgenhus, at No,20, is the only building in Inner Vesterbro under City Plan West, a municipal plan from 1958 for condemnations and urban renewal in the area. Kalvebod Brygge is a waterfront area in the Vesterbro district of Copenhagen, Denmark. The name refers to a section of the Ring 2 ring road follows the waterfront from Langebro in the north to the H. C. Ørsted Power Station in the south, the area is dominated by office buildings, Tivoli Conference Center, several hotels and the shopping centre Fisketorvet. The northern part of the road, northeast of Bernstoffsgade, belongs to the Indre By district and it is bounded to the north by the small Rysensteen Quarter where the Copenhagen Police Headquarters is located. 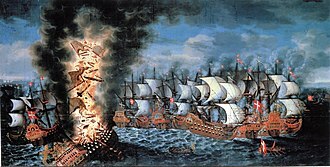 Both Kalvebod Brygge and the terrain, which separates the area from the rest of Vesterbro, are located on reclaimed land. 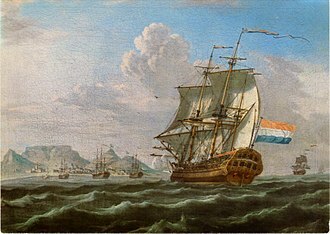 The coast south of Copenhagen was formerly known as Kalvebod Beach, the first land reclamations took place as early as 1755 when the area just outside the West Ramparts Rysensten Bastion was used for establishment of lumberyards. A little further to the south, Copenhagens first gasworks, known as Vestre Gasværk, the railway was constructed on reclaimed land between 1897 and 1901. A new goods station was built on the grounds. It was designed by DSBs head architect Heinrich Wenck and opened in 1901 and it was replaced by a modern goods station designed by Ole Hagen in 1968. The new railway obstructed the Western Gasworks access to the harbor, the Danish State Railways therefore agreed to building a new Gasworks Harbour on the east side of the railway as part of the project. The waterfront was redeveloped in the late 1990s, beginning from the north, the buildings along the quay are Nykredits Head Office, Copenhagen Marriott Hotel, The Engineers House and the Fisketorvet shopping centre. The Havneholmen mixed-use development was built on reclaimed land in front of Fisketorvet. In 2011, Nykredit expanded their headquarters with a new building, The Crystal, a new plaza was created in front of the building. The Kalvebod Wave was designed by JDS Architects and Klar and inaugurated in 2013 and it consists of an undulating wooden boardwalk which creates various new spaces for sitting and water-related activities. A masterplan competition for the part of the railway terrain along Kalvebod Brygge was won by Lundgaard & Tranberg. Photograph of Pedersen-Dan by Peter Elfelt.